The European Commission today (14 August) downplayed any risk of a substantial delay in Germany’s final approval of the eurozone's permanent bailout fund despite efforts to postpone a ruling on its legality. 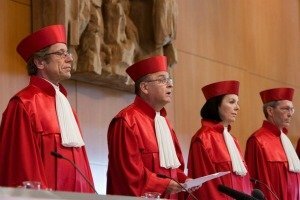 A group representing German academics announced Monday (13 August) they were seeking to delay beyond an expected ruling by the country's top court on whether the European Stability Mechanism (ESM) and the fiscal compact agreed by European leaders violate German law by taking responsibility away from national lawmakers. Europolis, led by Markus Kerber, said the German Constitutional Court should make no decision until the European Court of Justice has ruled on a similar case brought by an Irish lawmaker. The Karlsruhe-based Constitutional Court said last month it would announce its decision on the bailout fund and fiscal pact on 12 September. The Financial Times reported today that if the new challenge is accepted by the court, it could delay the creation of ESM by several months, creating instability in eurozone financial markets. But a spokeswoman for the Karlsruhe court was quick to deny any delay of the verdict and Ryan Heath, an EU spokesman for Economic and Monetary Affairs, also played down the risk of delay of the ratification in Germany. A European Court of Justice official declined comment and could not say when a decision would be reached on whether to give the Irish case accelerated procedure status, which would reduce delays to a minimum but has no timeline set to it. Easy to agree, difficult to ratify? The ESM, which would boost the firewall against debt crisis contagion to €700 billion, had originally been due to come into effect on 1 July. It needs ratification by countries representing 90% of its capital to be implemented – meaning it cannot be launched without Germany. German lawmakers have approved the rescue package, but it is awaiting the signature of President Joachim Gauck. Of the 17 eurozone countries, Austria, Belgium, Cyprus, Finland, France, Greece, Ireland, Luxembourg, the Netherlands, Portugal, Slovakia, Slovenia and Spain have ratified the ESM. Besides Germany, Estonia and Italy have not yet fully ratified it. The fiscal compact treaty has so far been ratified by seven of the 25 signatory states. At least 12 countries need to have ratified it before it would enter into force. Ratification of the ESM’s predecessor, the European Financial Stability Facility, sparked the collapse of the Slovak government of Iveta Radi?ová in October 2011. German public opinion has been broadly hostile to bailing out troubled eurozone countries and opposed to raising the firepower of the bloc's permanent rescue fund, the European Stability Mechanism (ESM). Germany is the biggest contributor to the ESM, which is funded by taxpayers' money. In exchange for Germany's solidarity with troubled eurozone member states, German Chancellor Angela Merkel insisted on a new European treaty to tighten fiscal discipline in the eurozone and deepen economic integration as a way to address the bloc's sovereign debt crisis.